Natural Medicine is a distinct system of non-invasive health care and health assessment in which neither surgery nor drugs are used, dependence being placed only on education, counseling, natural medicine modalities and natural substances. This includes, without limitation, the use of foods, food extracts, vitamins, minerals, enzymes, digestive aids, botanical substances, topical natural substances, homeopathic preparations, air, water, heat, cold, sound, light, the physical modalities of natural non-manipulative bodywork and exercise to help stimulate and maintain the individual's intrinsic self-healing processes. Whether they emphasize the use of hydrotherapy, nutrition, non-invasive manipulation, herbs, or homeopathy, all practitioners of natural healing aim at stimulating the body to heal itself. Vis medicatrix naturae, or 'the healing power of nature,' remains central to natural medicine philosophy today. Rather than trying to attack specific diseases, natural healers focus on cleansing and strengthening the body, regardless of the specific methodology used. The natural healers and practitioners of the late 19th and early 20th centuries conceived of healing as a process of bringing strength to the individual, rather than by curing specific diseases. All had a reverence for nature, and many of them could point to specific observations that led to the formation of theories and practices, rooted in personal experiences of illness and recovery that inspired them to practice natural healing. They frequently learned from each other or studied independently, instead of, or in addition to, receiving a formal education. Although most were persecuted by the medical establishment, those on record were highly successful, bringing good health to many people. 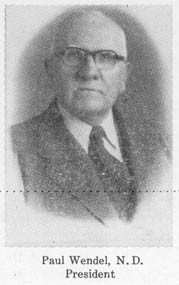 In 1902, Benedict Lust organized the Naturopathic Society of America, which was reorganized, in 1919, as the American Naturopathic Association (ANA). In 1921, Lust was elected president for life. Shortly after he died, a combination of inter-personal and philosophical differences caused the organization to split in two, forming the Eastern ANA and the Western ANA, each with its own constitution, officers, programs, and conventions. The Eastern naturopaths were determined to follow the example set forth by Father Kneipp et al., while those in the West seemed determined to "medicalize" naturopathy. 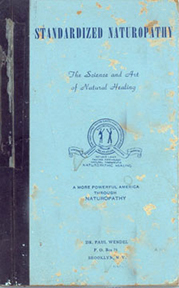 "Proclaiming their distinct perspectives, the two camps developed their own textbooks: Paul Wendel's Standardized Naturopathy (1951) and Harry Riley Spitler's Basic Naturopathy (1948)." By and large, all of the American naturopaths whose work is well documented had some kind of formal training in the natural healing arts or in medicine. However, not all of this formal education occurred before they began to practice. For example, after learning natural healing from Father Kneipp and others outside of a university setting and then establishing his practice, Benedict Lust earned degrees in Osteopathy and Medicine. After the American School of Naturopathy, which he had founded in 1901, gained its charter in 1905, it conferred on Lust the Doctor of Naturopathy degree. Early practitioners of "the nature cure" learned through observation and self experimentation. Later healers learned by apprenticeship. Some had a conventional medical education but rebelled against it, and still others supplemented their formal education in Osteopathy and Chiropractic with intense independent study. As to what kind of education these healers recommended for others, there was also variation. One healer, who felt that doctors should be artists rather than scientists, said "Furnish them with the necessary portion of anatomy, physiology and biochemistry, but not too much of it.” (Schweninger 1926, 43-46).At the American School of Naturopathy, students learned "basic sciences, physiotherapy, phytotherapy, geotherapy, electrotherapy, and mechanotherapy. Degrees in naturopathy and chiropractic were granted." Lust also established a school of massage and physiotherapy. In addition to classroom education, he offered naturopathic home-study courses through his journal. In 1947, in a speech before the Eastern ANA, then President Dr. Jesse Mercer Gehmann stated, "We need standards and we need more, to stand by them, once they are established. These standards should insist upon a thorough training in basic Nature Cure. All students should be required to be thoroughly competent in applying the methods of the old Masters...Our standards should include thorough training through study of Kneipp, Priessnitz, Just, Kuhne, Rikli, Trall, Schroth, Graham, Jennings, Lust and Macfadden...We need adequate standards for entrance upon training for a Doctorate in Naturopathy, but these standards need NOT be, nor should they be patterned after the medical requirements. Our work is not based on warped and decadent pathology, bacteriology, or biology.” (per Freibott 1990, #7).